A gorgeous hideaway tucked up in a wonderfully secluded area, thoroughly enjoyed our stay and would love to return someday soon. 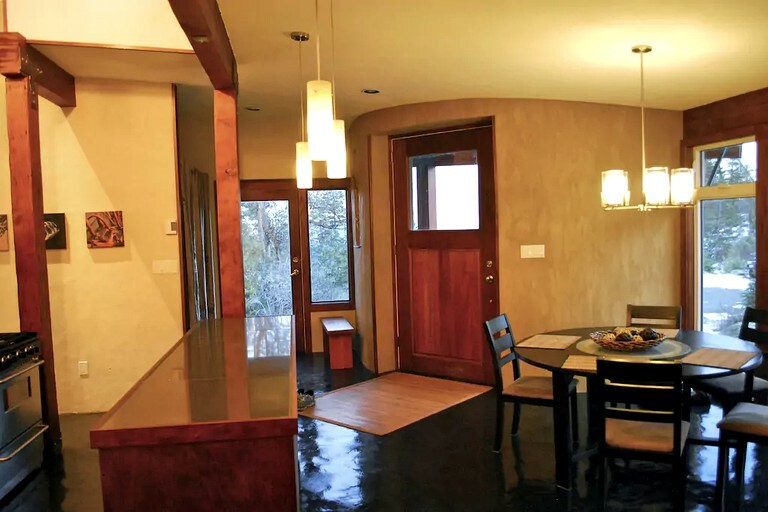 One of the most “green” homes in the country, this eco-friendly rental provides a unique opportunity to stay in a cob structure in South Vancouver Island and can sleep up to six guests. The cob-style is a traditional building method using walls made of clay, sand, and straw. 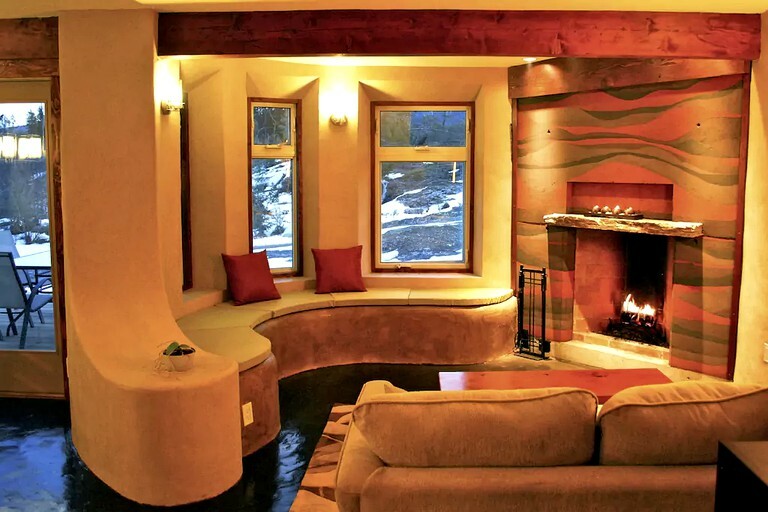 This form of earthen architecture has exceptional environmental and health benefits. 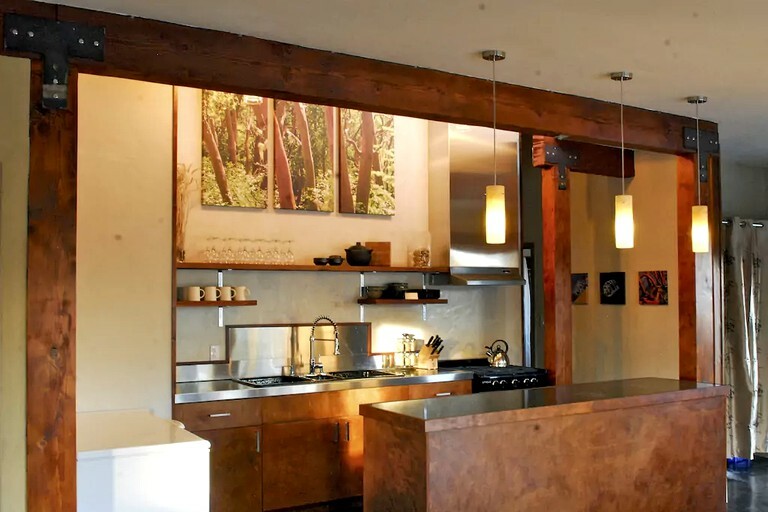 The house is one level with 1,000 square feet of interior space, 13-foot vaulted ceilings, and salvaged old growth posts and beams in every room. 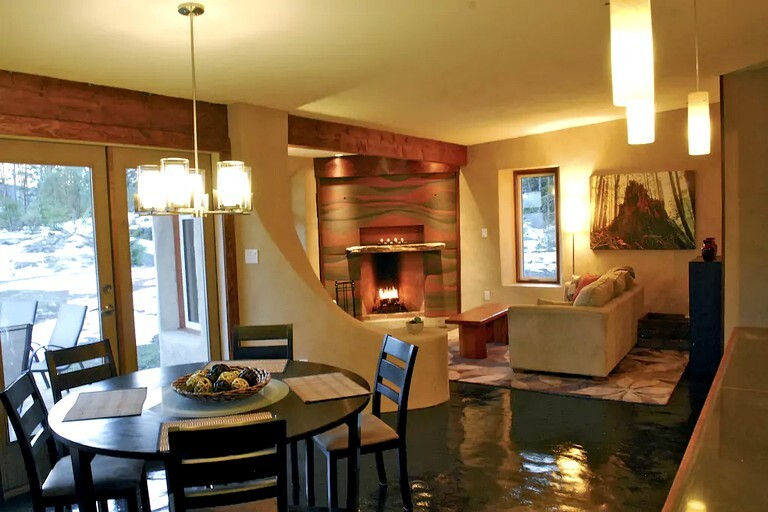 It was designed and finished in a contemporary west coast style and features. 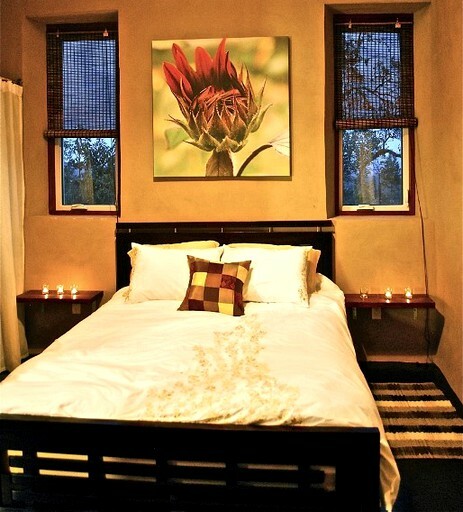 Guests here will find two bedrooms with queen-size beds, eco-foam mattresses, down duvets, and bamboo and organic cotton sheets. 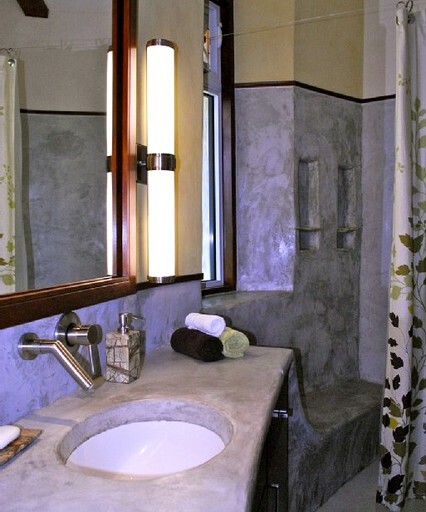 There is a bathroom with low-flow dual flush toilet, large vanity, and a shower with built in bench finished with natural lime plaster. Guests will have a well-equipped contemporary kitchen with super energy efficient large fridge, a full size gas stove, a huge cast iron sink, and plenty of storage and counter space. 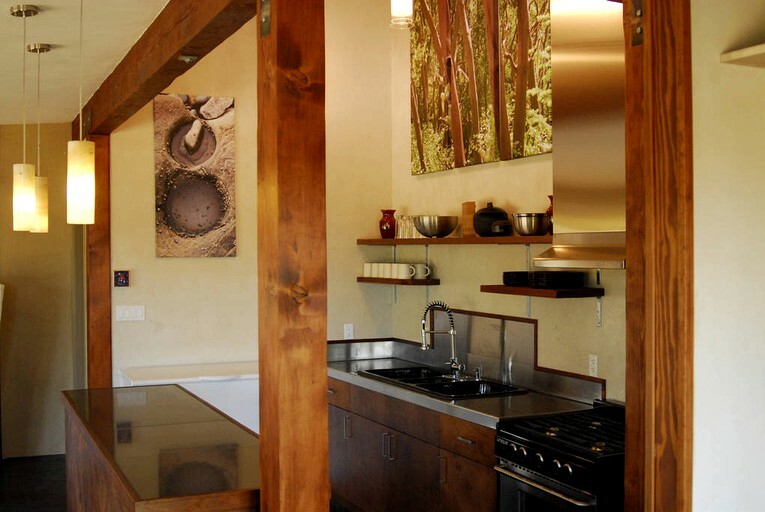 Furthermore, guests will enjoy a full selection of dishes, mugs, glasses/wine glasses, utensils, pots and pans, spice rack, french press coffeemaker, and stove-top kettle and toaster. 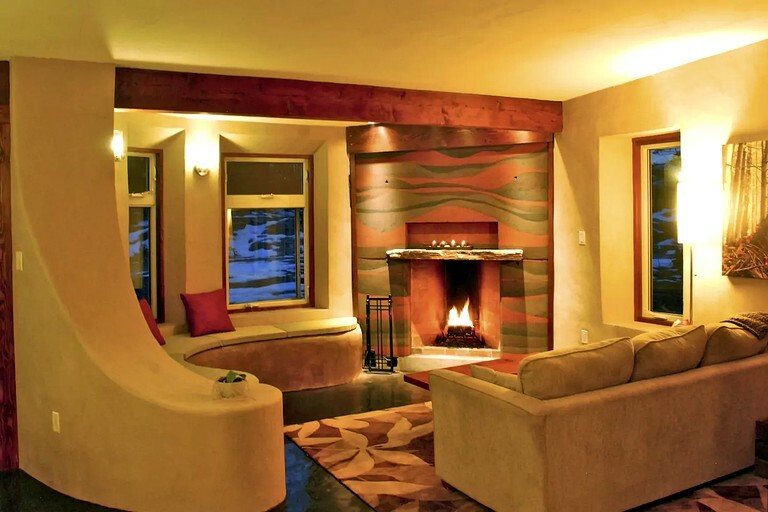 The living area comes set with a queen-size pull-out sofa bed, a large built-in cob bench, and a Rumford wood-burning fireplace faced with a natural rammed earth design. Furthermore, there is a south-facing patio with a table, chairs, a barbecue, and a fire pit with wood supplied. Please note that due to the off-grid location this host cannot provide a land line or internet cable; however, there is excellent cell reception and cell phones can be set up to a wireless hot spot, or guests can bring a turbo stick to access the cellular network. This host does not provide high-energy-use appliances, such as a television, a washer and dryer, or small electric kitchen appliances. Guests may bring their own small appliances, but they should be aware that if solar power is low, they might need to run the generator for additional power. The house does have a full-size fridge, freezer, and stove/oven, as well as non-electric small appliance options, such as a stovetop kettle, a stovetop toaster, and a French press coffeemaker. There is also an outdoor barbecue, and the kitchen is fully stocked with dishware, utensils, pots, pans, and more, to make creating meals off-grid an enjoyable experience. 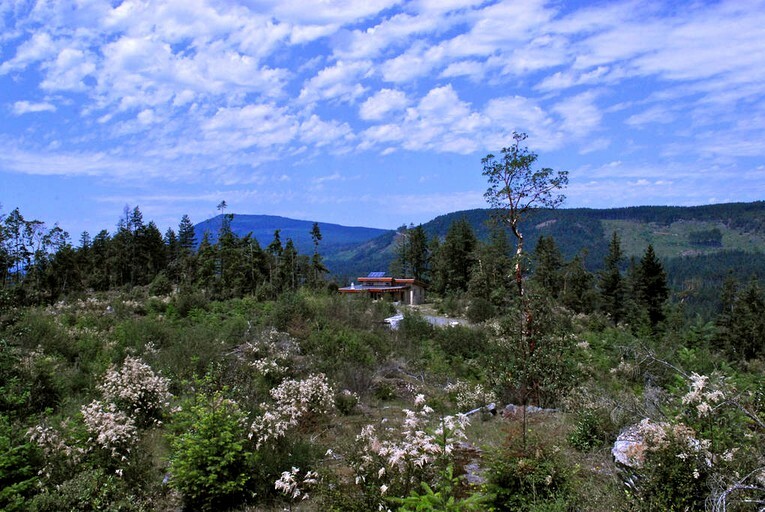 This eco-friendly retreat is the most private and breathtaking spot in the Cowichan Valley! Set on a 40-acre property surrounded by thousands of acres of beautiful Douglas Fir and Arbutus forest, guests will feel like they have truly gotten "away from it all,'"
while staying within a 15-minute drive of Duncan and Lake Cowichan. 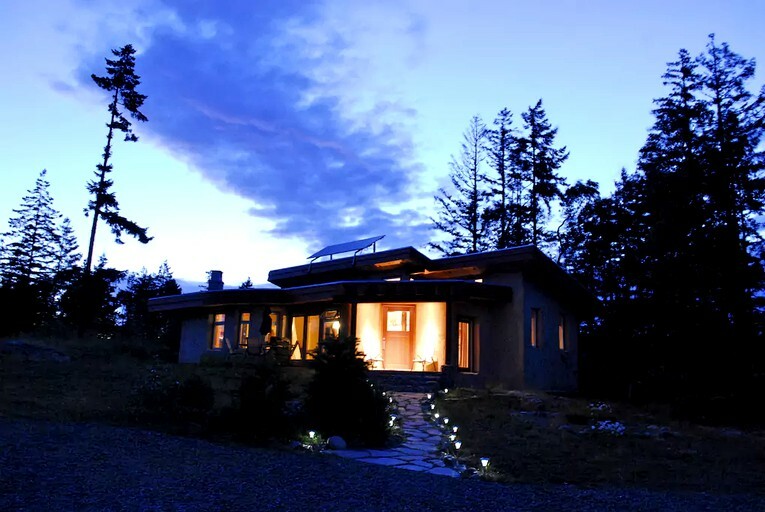 This eco-retreat is located on top of a bluff in the center of the Cowichan Valley, offering truly unique and stunning views. 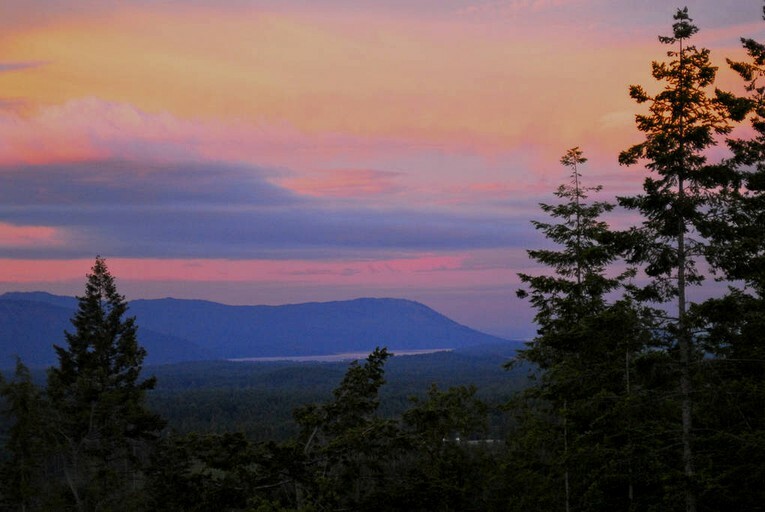 Hiking along the bluff provides a spectacular perspective of this beautiful valley, from Salt Spring Island and the Pacific Ocean in the east to Bald Mountain at the center of Lake Cowichan in the west. Guests will appreciate the forested valley walls surrounding them in a way which just isn’t possible from any other vantage point. 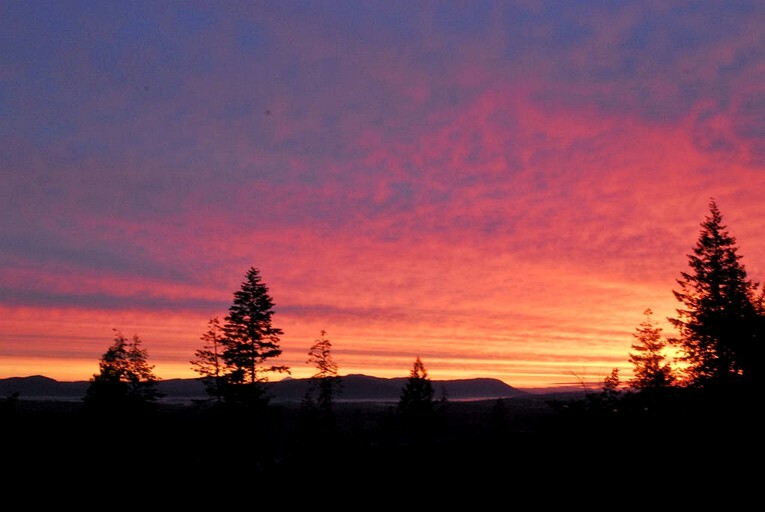 Stoltz Bluff affords magical views throughout the day and the seasons. 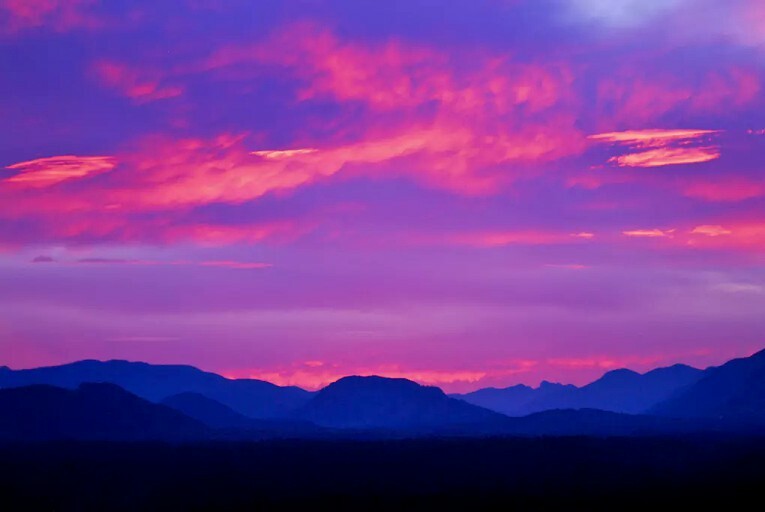 Guests can take in both sunrises and sunsets, as well as brilliant fall colors, snowy mountain tops in a white winter wonderland, carpets of spring wildflowers, and of course, warm, dry summers with endless blue skies. Even a cloudy day at this property is a special experience, as guests look down on the cloud-covered valley and feel as though they are floating on their own private island. Stoltz Bluff also provides one of the best bird watching locations in the valley due to its high elevation and proximity to the thermal winds that birds of prey love to glide on. 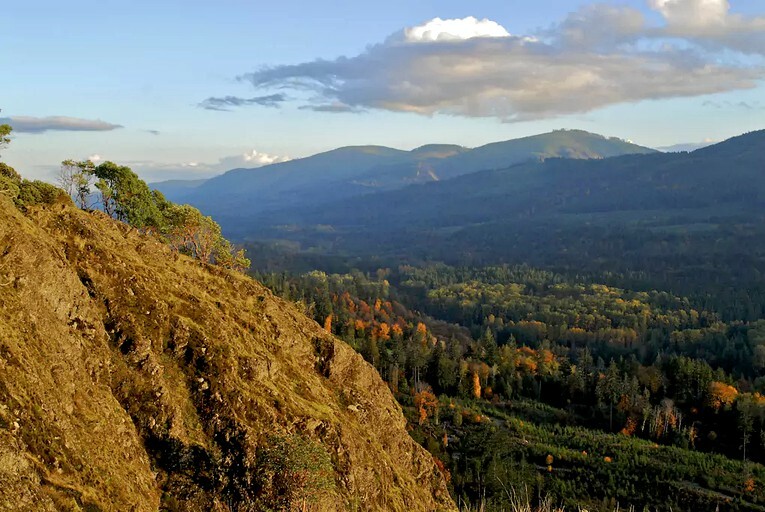 With such a panoramic view, observing eagles, hawks, and vultures in the sky is commonplace, along with a large variety of birdsong in the Douglas Fir and Arbutus forest. If glampers are interested in viewing some aquatic life, take a short trip to the Cowichan River to see the salmon run, or a quick drive to the ocean to look for sea lions, seals, whales, and much more. This property requires a two-night minimum stay. There is a refundable damage deposit of $373.20. Smoking is not permitted indoors.